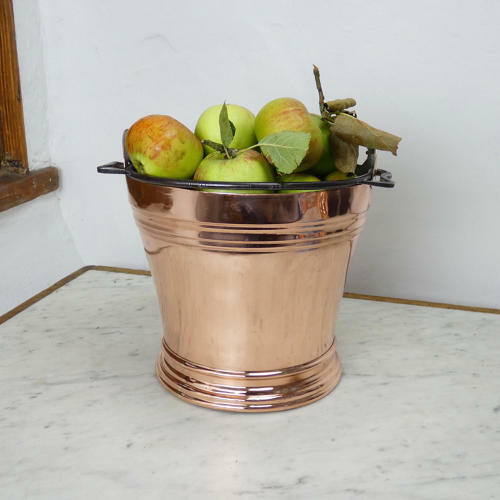 A 19th century, French copper bucket. This piece would originally have been made as a milking bucket, as the interior was tinned, but now would be useful as either a coal bucket or a waste paper bin. It is nicely shaped and has a ridged base and rim and a steel handle. It is made from a substantial gauge of copper and it has a castellated seam up the side. The raised lugs, on the side, also have castellated seams to attach them to the bucket. It dates from c.1870. There is a split in the copper, on one side of one of the handles, but other than this it is in very good condition.